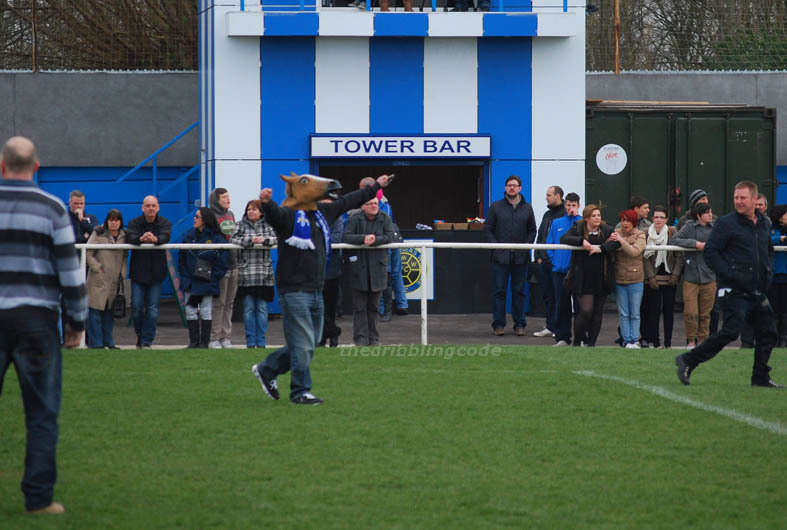 Pre-Match Build-Up: Like flies on sherbert, Staveley’s first ever appearance in the FA Vase semi-finals was the obvious draw card for any nearby groundlegging types this afternoon. Staveley had already got further in the competition than anyone would have reasonably expected – now all that stood between them and an appearance at that great big place in London called Wemberleey was a team of those pesky Northern League blighters – the type who always seem to excel in this particular competition nowadays. 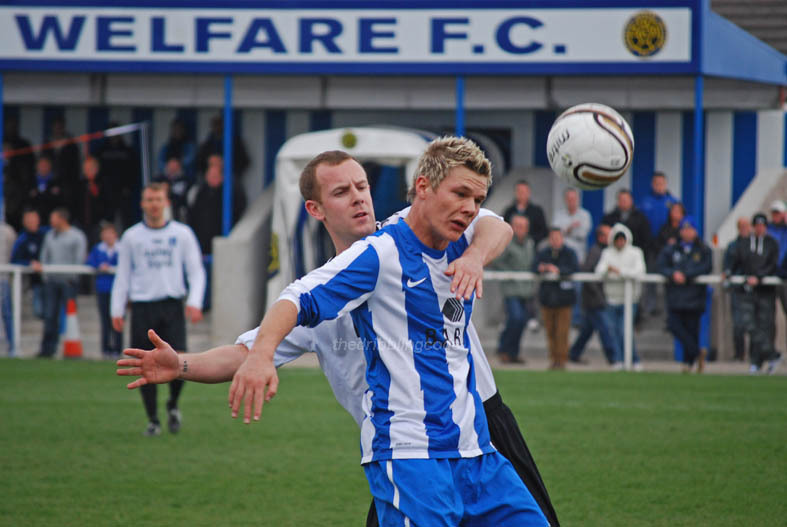 To succeed, Staveley would have to overturn a one-goal defecit from last week’s first leg, in this return home tie. Could they do it? Well, no actually, but it was a top afternoon’s entertainment any road. Destination: Inkersall Road, Staveley, Chesterfield, Derbyshire, S43 3JL. Directions: The nearest glittering metropolis to Staveley is Chesterfield, so public transport travellers are advised to take a train to Chesterfield, then catch either the 70/71 or 77 bus from Beetwell Street (near the library/outdoor market), which is 5 mins walk from the choo-choo station. The bus takes around 20 minutes, and drops you off pretty much at the end of Inkersall Road. 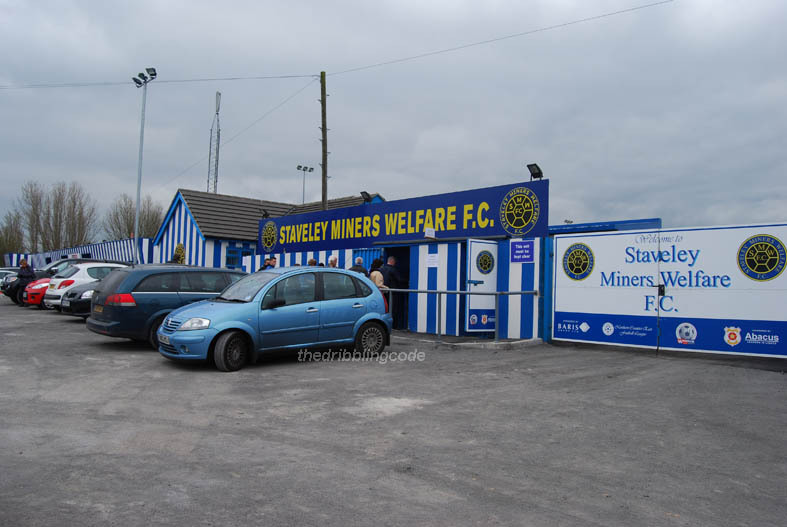 From here, the ground is a couple of hundred yards away on your right, and is easily spotted due the the big ‘Staveley Miners Welfare’ sign in the car park, and the blue and white stick of rock/football rattle type stripes which the entire frontage of the ground is painted in. Nice. 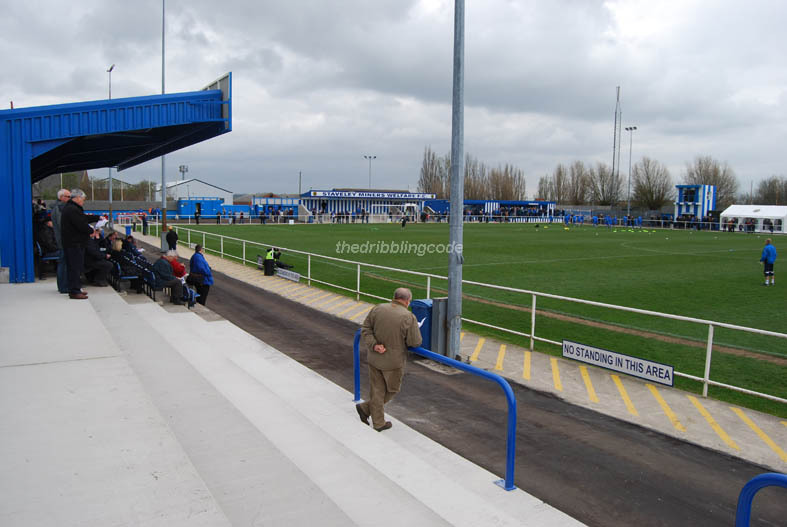 Off The Pitch: Staveley’s ground is for sure an impressive beast – mucho improvments of late mean that aside from needing some additional seating, it comes across as closer to a Conference standard ground than a Step 5 one. 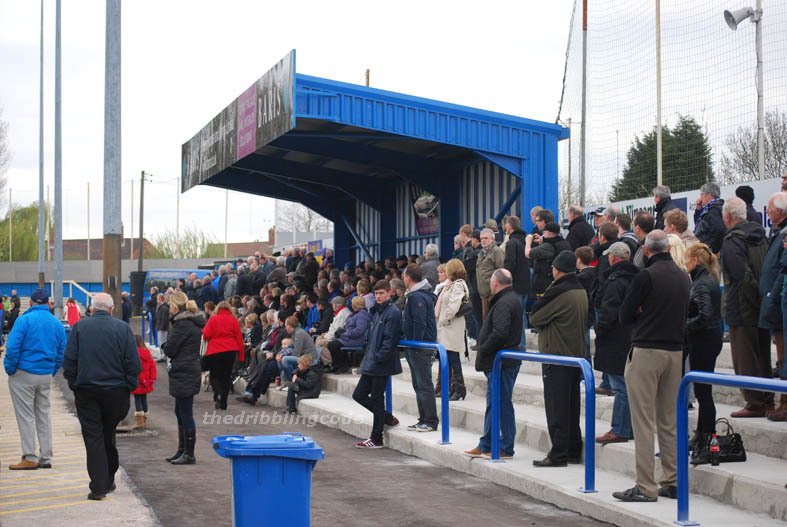 Recent weeks have seen a lot of additional terracing introduced in order to meet the grading deadline, so that should the club finish top of the NCEL at the end of this season, the off-pitch facilities would be up to scratch for a step up to the Northern Premier League. 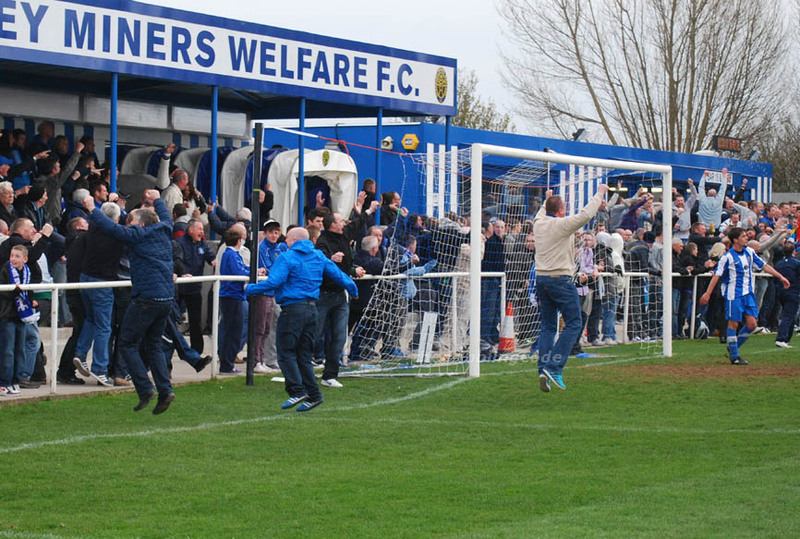 There’s certainly plenty of space available at Inkersall Road for the club to develop the current location into whatever they want. 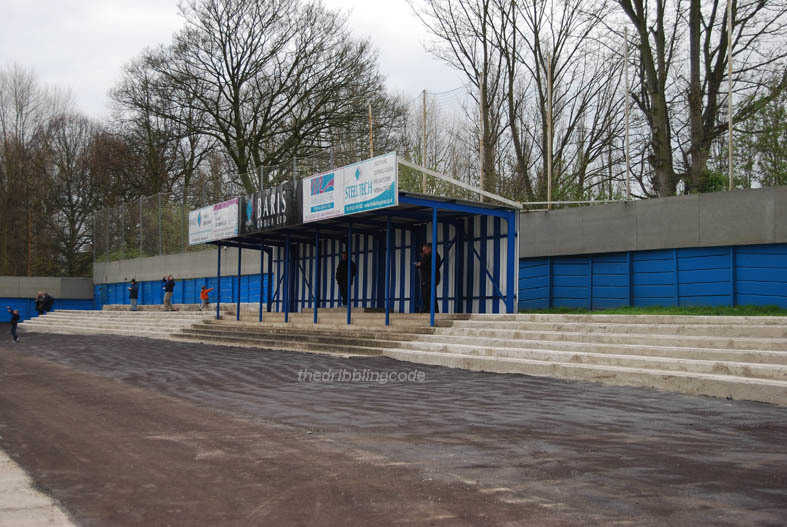 Lovely wide stretches of tarmac and terracing surround the pitch, with three covered stands – one of standing accommodation behind each goal, and one of seating across the halfway line. 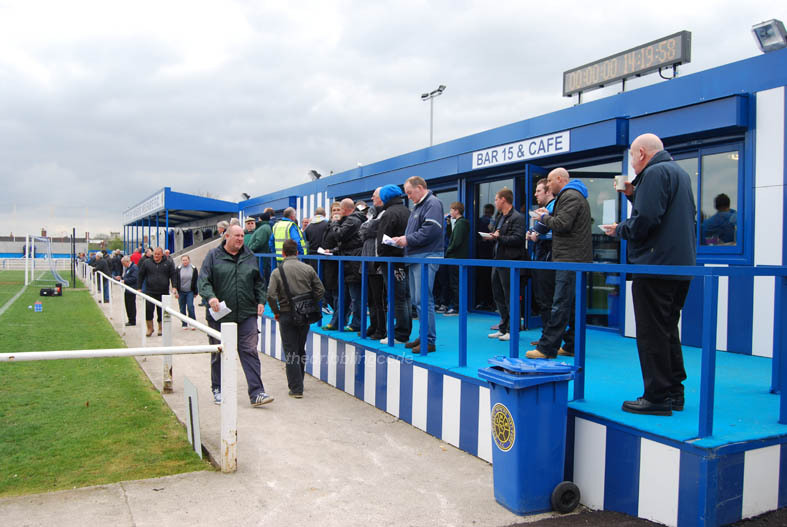 There is also a large bar / clubhouse, a newly introduced outdoor ‘beer garden’, and the two-tier ‘Tower Bar’ as pictured below, which has a snap hatch down below, and an area above which was being used today as a TV gantry. 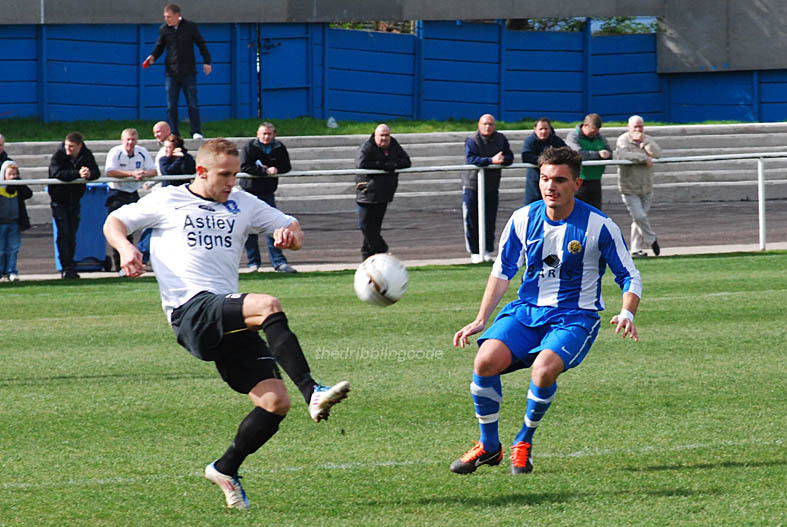 On The Pitch: With Dunston UTS leading 1-0 from the first leg, this game was about as finely poised as you could get. 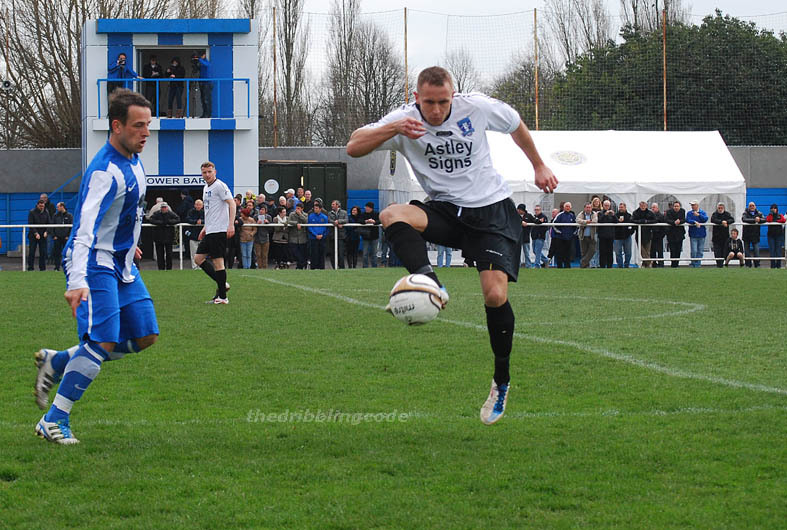 Both sides came raring out of the blocks, with some hard tackles flying from Dunston in particular. 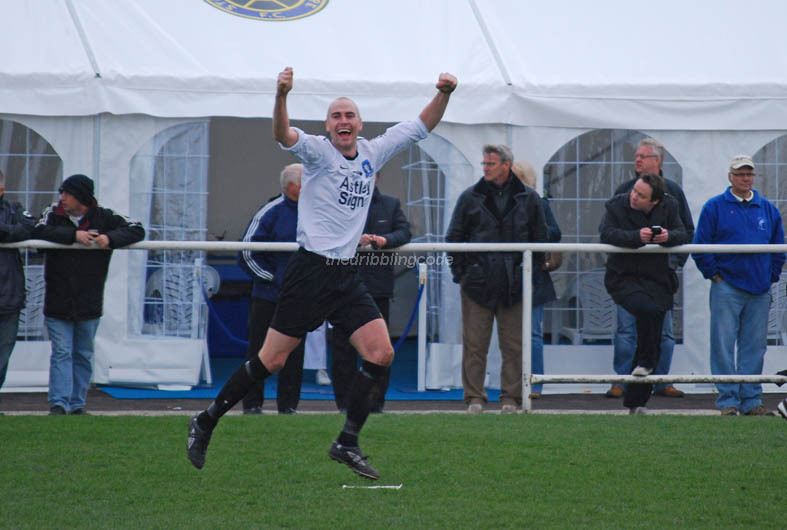 Staveley got the dream start they wanted, with little more than five minutes on the clock Simon Barraclough received a through-ball just inside the left corner of the penalty box, and executed a quality finish which flew past the Dunston keeper and nestled just inside the opposite goalpost. Dunston came back strongly though, and after Daniel Craggs had sent a free header from a Lee McAndrew cross just wide, an even better opportunity was to follow after 15 minutes. A free-kick on the left was whipped in by full-back Terence Galbraith, Michael Dixon was at the far post in enough space to calmly knock the ball back across the box, and with Staveley keeper Ian Deakin in no man’s land, a grateful Dunston top-scorer Andrew Bulford calmly side-footed past the lone defender on the goal-line to even the scores up. A delighted Bulford was promptly booked for over-celebrating his goal amongst the away fans, and this was to prove costly on the half hour mark, when he was shown a further yellow for a scything tackle which in all honesty was probably a straight red in today’s noncy climate. 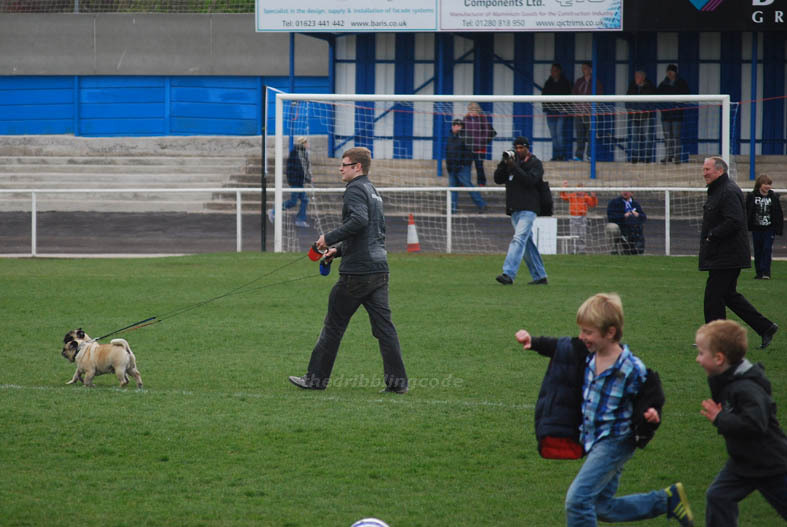 Bulford looked devastated as he trudged off, and when Staveley got a further goal shortly before half-time courtesy of a Chris Coy tap-in, not many in the ground would have predicted anything other than a Staveley win during the second period. 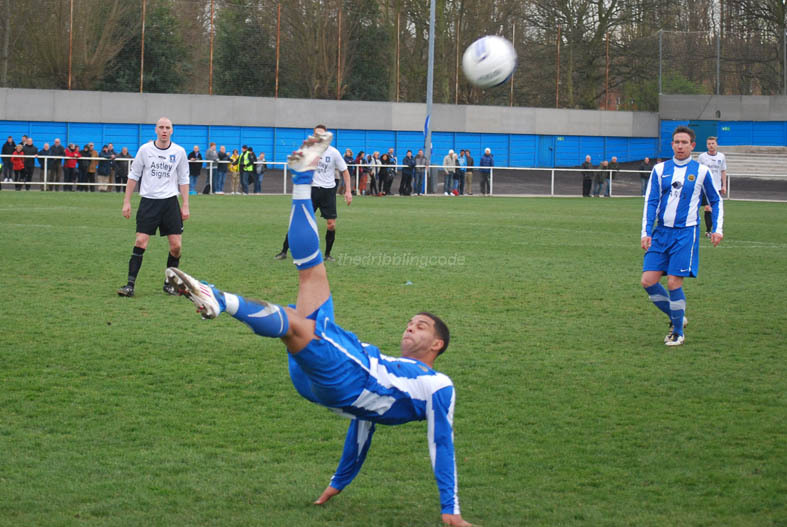 Dunston though, were not about to give up the game. Knowing that to get anything out of it now, they would have to work harder than the home side, they came out after the break and did just that. 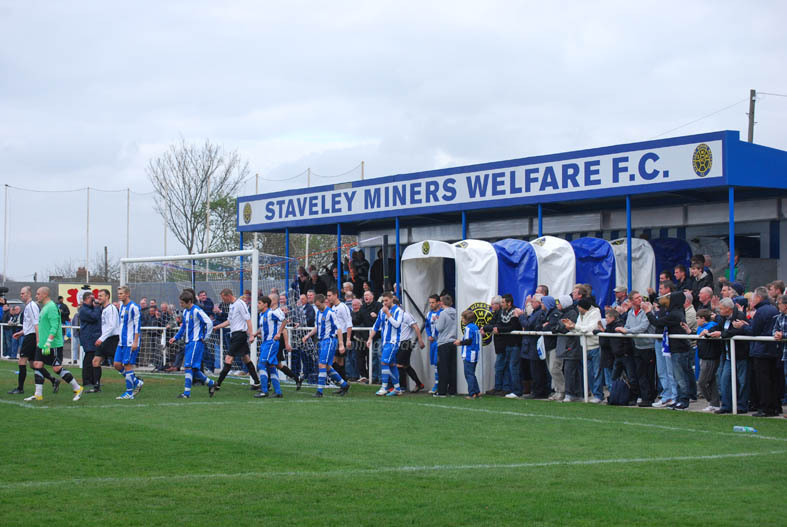 Staveley, meanwhile, were very subdued, and whether consciously or not, had reverted to playing like they just had to wait for the win to come, rather than force it on the pitch. 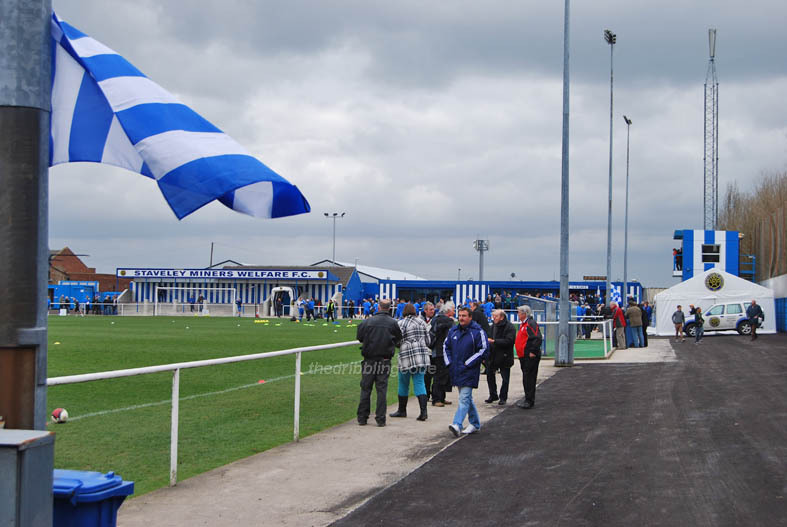 As a result, Staveley’s performance nosedived to something with no real purpose or pattern to it, and Dunston always looked capable of something on the break, and by now lone striker Micheal Dixon was well on his way to a man-of-the-match performance. Confusion turned to disaster for Staveley on 71 minutes, when Simon Barraclough caught a Dunston defender with an elbow and the referee seemed happy to even the numbers up and order him off with a staright red card. 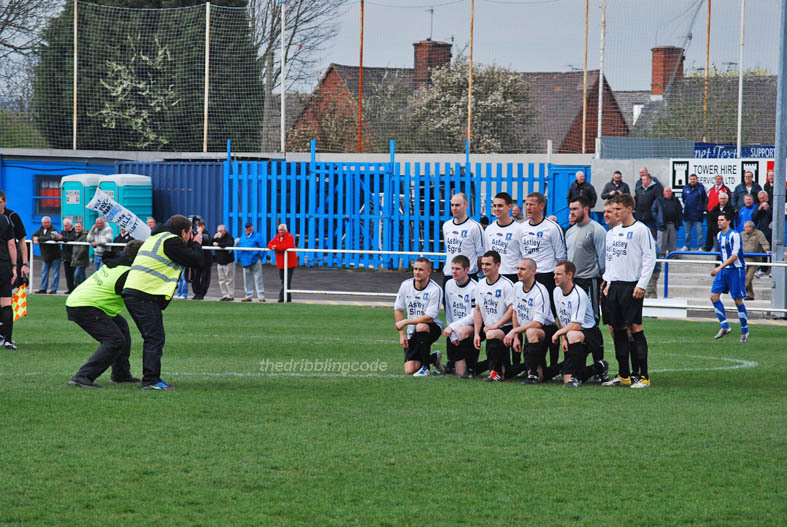 In the ensuing melee, Dunston’s goalkeeper looked to have headbutted a Staveley player – even the Dunston fans couldn’t believe how stupid this was and were expecting the worst – however the ref and linesman batted not an eyelid for some reason and he got off scot free instead. This proved to be the last piece of luck Dunston needed, as from here-on-in it was endevour and pure quality which won them the game. 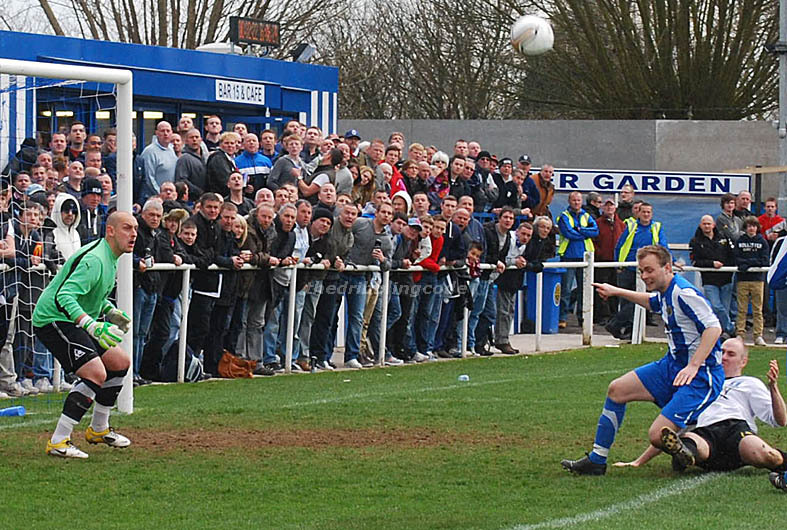 With just five minutes to go, Stephen Goddard slipped his marker, and when the ball was played across to him on the penalty spot from Steven Shaw, he had so much time he was able to let the ball bounce four times before sidefooting it over a lunging Staveley keeper Deakin and into the roof of the net. 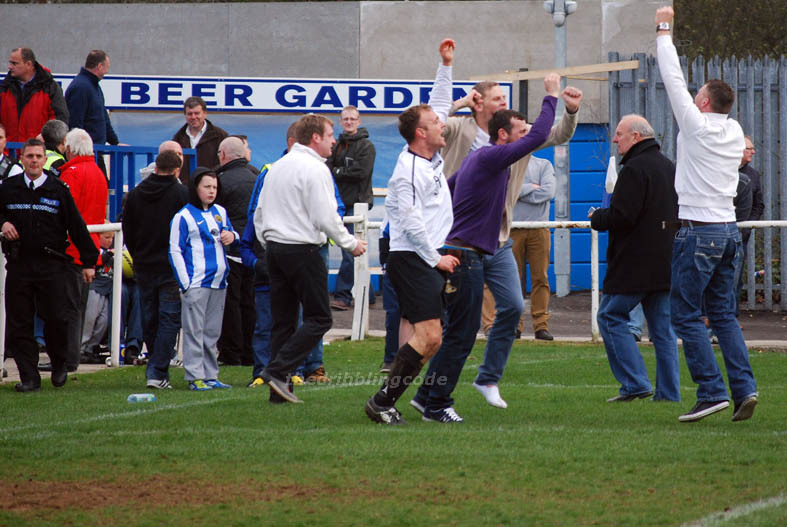 Although the horror of what was happening briefly woke up Staveley for the final few minutes, the game was already beyond them and Dunston closed out for an historic victory. 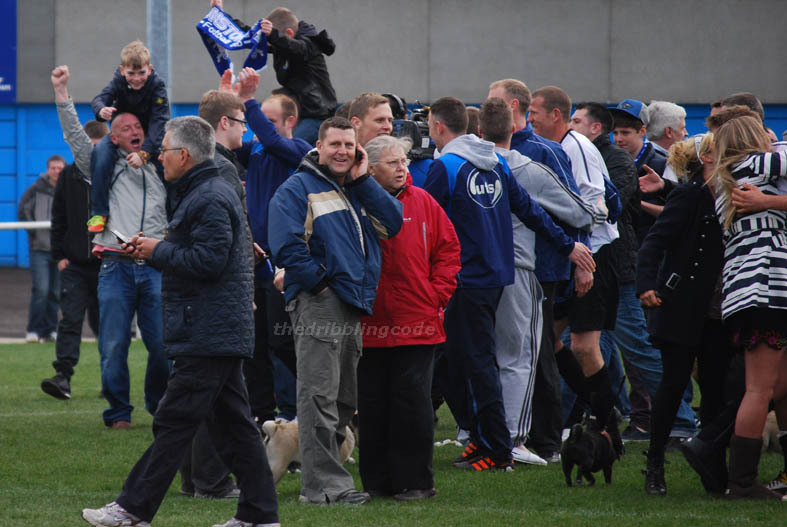 Although from a personal perspective it would have been nice to see NCEL representatives Staveley win through to the final, it would be a meaner bugger than myself who would begrudge the loyal volunteers and supporters of Dunston UTS such a richly deserved end to their season, and culmination of several decades of hard work behind the scenes. 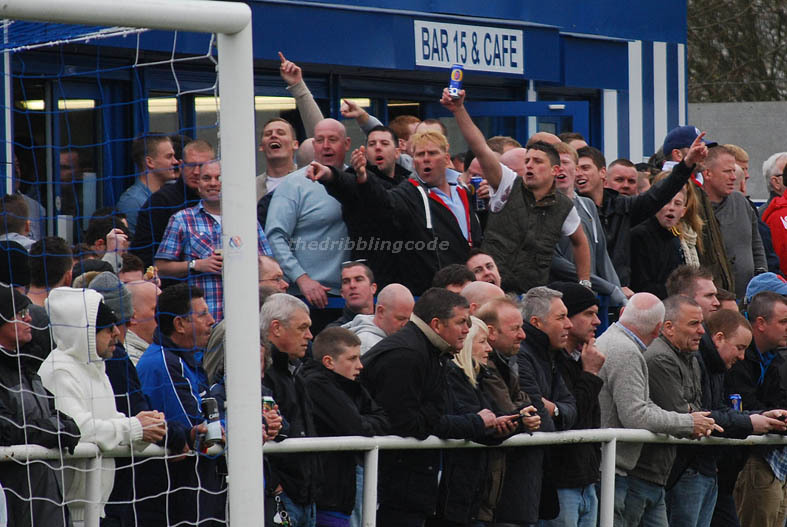 This entry was posted in Staveley Miners Welfare, Uncategorized and tagged chesterfield, fa vase semi final 2012, inkersall road, staveley. Bookmark the permalink. Love pic 7 – of the faces looking to the right at the action. Absolute classic. Like the shot of the fella holding his child by the anklestoo! Interesting to see how the ground has been developed since I was there earlier in the season.